Airlines added an extra 2.8 million seats into and out of Australia in 2013. However, the market was unable to absorb the 7.1 per cent increase in available seats to 42.1 million, with the number of passengers carried last year up 5.9 per cent to 31.3 million. The data from the Bureau of Infrastructure, Transport and Regional Economics (BITRE) also shows that although Qantas remains the largest international carrier from Australia, the airline was continuing to lose market share to its competitors. Qantas flew 17 per cent of all international travellers to and from Australia in 2013, down from 17.7 per cent the prior year and well below the 31.4 per cent a decade ago. Meanwhile, the combined 2013 total for Qantas and Jetstar was 24 per cent, compared with 26 per cent in 2012. Qantas alliance partner Emirates (9.3 per cent) was the next largest in 2013, followed by Singapore Airlines (8.9 per cent) and Air New Zealand (7.8 per cent). Virgin Australia and Jetstar both had a 7.7 per cent share. One sector that is growing in the Australian market is low cost carriers, with the likes of AirAsia, Jetstar, Tigerair and Scoot now comprising 14.4 per cent of all international traffic, up from 13.6 per cent a year ago. I think that is called capacity dumping, anti competitive behaviour at its best. 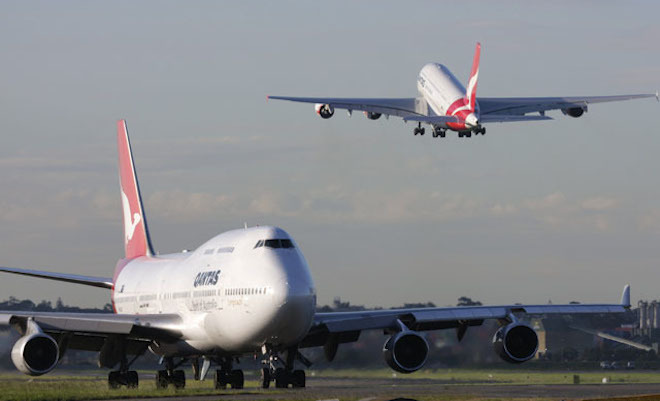 Our open skies policy is a joke & a major factor in the demise of Qantas International.